Michele is Co-Editor of The SayWhatClub (SWC) newsletter, Online Voices. She contributes regularly to the SWC weblog. Michele also advocates for captioning in her community and online. She has come to terms with her progressive bilateral sensorineural hearing loss that began more than four decades ago, learning much from the loss and appreciating the experience for all it has taught her. Michele has four grown children and one grandchild. She lives in northern Minnesota with her husband and enjoys traveling, gardening, and kayaking on the wilderness river near her home. Pearl: Michele, tell us about growing up in your family and at what age did you lose your hearing? I have many fond memories of my childhood, and many wonderful experiences with relatives that touched my life, but looking back I see that I lived much of my childhood inside my head. Some of that is related to hearing loss, but also it’s a testament to having a great imagination and creative spirit. How much those things are intermingled is not completely clear to me. I grew up surrounded by nine male cousins. My sister and I were the only girls in the family, and I was the youngest, which meant I always had to work hard at being included. Thinking about it now, that probably served me well once I began losing my hearing, as those with hearing loss have to work very hard at being included. Let’s just say I was never the first pick when choosing teams for Flies and Grounders and Army. I was a tomboy. My mother was a single mom, and my grandmother lived with us for most of my childhood. I never knew my father. My grandmother took care of us girls while Mom worked, and we learned many wonderful things from her (my mother also), and I can remember sewing my own school clothes in third grade. I learned to cook by helping in the kitchen and by canning and preserving with my grandmother. The years when my grandmother didn’t live with us were challenging, and I have some not-so-fond memories of those years. I’ll simply say, my hearing loss did not get top billing on the list of challenges I had to deal with throughout my life. I really didn’t give my hearing loss much attention until I was well into my 40’s and I am currently 52. In elementary school, I flunked the hearing screening test that was given, and that was the first indication that there was a problem with my hearing. It was recommended that I see a doctor, so my mother took me to the county clinic where it was confirmed that I had a hearing loss. I remember the doctor telling my mother that I most likely had begun losing my hearing years earlier, since he noticed, during the exam, I was already proficient at lipreading. As best I can remember, the doctor said there wasn’t much to be done for “nerve damage”, that I’d probably continue to lose more hearing over time, and would be deaf at some point in adulthood. He cautioned my mother on noise exposure and sent us on our way. I don’t remember anyone mentioning hearing aids. I had no clue, up until that point, that how I heard was not normal. How would I know? Other than having my hearing tested yearly in public school, failing my hearing test was never discussed for the rest of my childhood. I learned to deal with it on my own, and fortunately for me, the brain is an amazing thing and took charge. Over the years, I unconsciously learned many visual skills, in addition to lipreading, that allowed me to cope very well. I made it easy for those around me to forget that I even had trouble hearing. Pearl: Are there any other family members with a hearing loss? Yes, my grandmother was deaf. She lost her hearing at a fairly young age. I always remember her as being deaf. It has always been assumed my hearing loss, as well as hers, was hereditary, since she had an aunt and uncle who were referred to as “deaf and dumb”. Pearl: Do you currently wear hearing aids or do you have a C.I.? I do not wear hearing aids, though I have tried them every few years from age 21, without success. I currently have a bilateral, profound, sensorineural hearing loss, with only a few remaining low tones in my left ear, and was evaluated for cochlear implants at the Mayo Clinic, in December of 2010, and qualified. However, I’m taking my time to make sure this is the route that is right for me. It’s a very personal decision. Pearl: So your primary means of understanding receptively is through lipreading? I primarily communicate in the hearing world through speaking and lip/speech reading. I don’t know or use ASL, other than finger-spelling, which my grandmother taught me as a child. I often get “compliments” on my clear speech and I’m an adept lipreader, but as we all know lip/speech reading is only effective when there are lips to read, and even then not everyone is readable. Pearl: Do you believe in universal captioning? And why? I wholeheartedly believe in universal captioning! Without captioning, I do not have access to communication the way a hearing person does. I need captions to understand and participate in a world where it’s assumed everyone can hear or knows sign language. Some of my earliest memories are of needing to see speech. If I can’t see it, I can’t understand it. Captioning is relevant to me in other ways. It’s a global world out there, and through my travels, I often need to see speech translated. I find it interesting, in the countries where it’s least likely for an English-speaking person to understand the foreign language spoken, communication seems easier, due to widespread captioning for translation purposes. For example; navigating the airport in Japan was easy, as all of the information the traveler needs is printed out in English as well as other popular languages. Very few English-speaking people are fluent in Japanese or other East Asian languages, so obviously, announcements cannot be understood. However, the airport provides captioning on billboards to accommodate the travelers. I can guarantee you, if you are a hearing person, in a foreign country, and needed English captions for television and movies, or presentations, seminars, and meetings, you would feel lost without an interpreter and have no way of knowing what was being said. I’m certain, no hearing person would complain that the captioning is interfering with their viewing experience or rights as a hearing person. They would be happy for the captioning and accommodation, just as we who cannot hear are happy when we are accommodated. Pearl: Michele, you obviously have traveled a great deal, why is that? and how did you get along in those countries with a hearing loss? I’ve always loved to travel and since my grandmother had to be escorted on her flights to visit relatives, I volunteered to accompany her and I would usually have to fly alone, one-way. From that first flight, I was smitten, and every opportunity I had to travel, I jumped at. The adventure was the focus. My husband was active military for the first eight years of our marriage, which required us to move around a lot, and we made friends from many different places. Later, after leaving active duty, Tim worked in the aviation field and eventually was employed by a major airline, thus enabling our entire family to fly anywhere in the world, unlimited, for little or no cost. After our children grew up and became independent, we had more freedom to take advantage of any travel opportunities that arose. I also have traveled by myself, and I can honestly say my hearing loss has never inhibited me. Of course, traveling would be so much easier for everyone, hearing or deaf, if the travel industry would totally embrace captioning and text to go along with their announcements and video presentations. Granted, there has been a noticeable improvement over the last decade, but we have miles to go to make those changes universal and uniform. Pearl: Did you find any one country to be the most sensitive about hearing loss? and how? It may seem odd, but I understood and got along much better in places like Amsterdam and Belgium than I did in the UK and Ireland. Yes, I could read English in those English-speaking countries, but my lipreading skills flew out the window. I think I was more tense when traveling in the UK and Ireland, because there was an expectation that I should understand the language … after all, I do speak English, but when you’re a lipreader you don’t do accents very well at all. At least in foreign language speaking countries I’m on an even playing field with the other Americans who don’t speak the language, and I’m not expected to understand their foreign tongue, so there is more of a improvised physical communication to fill in the gaps. The other aspect of my understanding so much better in Amsterdam and Belgium is the high percentage of English-speaking population, who speak with virtually no accent. They spoke English much better than some Americans I know. I was amazed at how well I could lipread English in those two places. I guess maybe I haven’t noticed a difference between one country’s sensitivity to hearing loss over another, because when I travel I rarely focus on my being deaf, other than making people aware of it. Most of the time, I’m treated as a capable person, because I believe I appear capable. No negative incident comes to mind when thinking about this, and I never realized that before, so thank you for making me aware of this. I’ll certainly try to be more focused on how sensitive a city is toward hearing loss during my travels. Pearl: Do you believe that hearing people understand what it means for us to have access to captioning and why? No, for the most part, hearing people don’t give hearing loss the same credence they would a more visible disability. You look okay, you speak okay, therefore, you must hear okay. The truth is, unless you are living with hearing loss you can’t know how debilitating it can be. It’s not visible to others. So much of our environment is cued through sound and hearing sound, but when it comes to speech, when it’s impossible to lipread, it’s all about hearing, so we need a way to see speech, and captioning is the most universal way. Most of us who cannot hear, especially, late deafened individuals, do not know sign language. I live in a hearing world and I don’t know very many people who know sign language, outside of those I’ve come to know in association with the online forums for people with hearing loss that I belong to. If I could, I would love to be able to impose deafness on the masses for just one day. Maybe then the hearing public would realize how much the inability to hear can wreck the daily workings of your life. That’s exactly what hearing loss does, it throws a wrench in the workings of communication, and no hearing aid, no cochlear implant, no alternative way to communicate can fully replace hearing in the way that it enables you to participate in life. Even with assistance, communication still poses some challenges. I’m not against hearing aids, cochlear implants, or sign language, and I think it’s wonderful that many find their ability to communicate is enhanced by these things, but I’m someone whose life experience has caused them to rely solely on seeing speech. Captioning is a very good solution for me, and for those who use assistive technology. 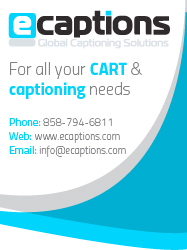 It puts all of us in the same pot, and captioning is the one solution that works for all. Mix in those needing to see speech for translation purposes and that pot gets bigger. I’m actually thankful for how our world is becoming more global with each day, as no one rails against captioning for translation the way they do at captioning to accommodate the deaf, deafened and hard of hearing. I’ve thought for a very long time that the need for speech-to-text translation will spill over to benefit those of us who need captioning due to hearing loss. Pearl: When and where was your first captioning experience? How did you feel about this experience and what were your thoughts? My first real exposure to captioning was on television, more specifically PBS and Sesame Street in the early 80s, when my kids were small. I began using captioning on TV as it became more and more widespread. Currently, I cannot understand anything without captioning, so if the TV is on, the captioning is enabled. As I said earlier, I didn’t give my hearing loss much attention until I was in my 40s. Having four children, a husband, and a family that moved from state to state frequently, took up my attention. I’m one of those women who forgot to put themselves on the list for a few decades, so I wasn’t very knowledgeable about what was available to me as a person with hearing loss, beyond TV captioning. It wasn’t until I joined the SayWhatClub, in 2008 that I learned about relay service, Captel, and other assistive technology that assist people with hearingloss and deafness. Since that time I’ve undergone an education, and by sharing my experience and learning about “what works” for others with hearing loss, I’ve enhanced my own life. I’ve become comfortable with being part of that huge number, over 40 million in the U.S. alone, of people with hearing loss who need captioning to understand speech. Further, through CCAC, I’ve learned about CART, the advocacy efforts to secure captioning for cinematic and live theater, and many other applications for universal captioning. It’s only in the last several years that I’ve advocated for captions on a personal level. 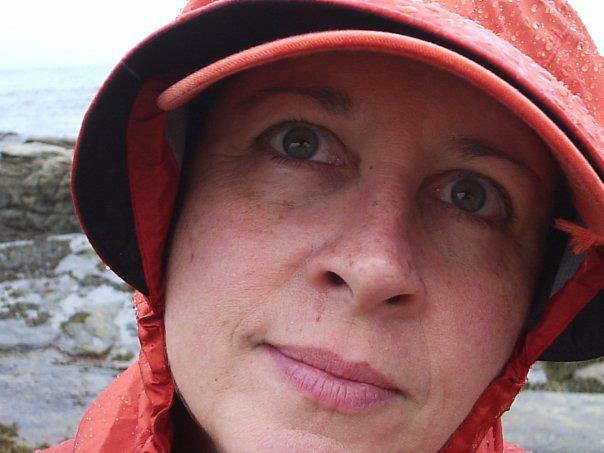 That led to my wanting to be part of a more collaborative effort for change in a bigger way. It’s so simple! Without captioning I’m excluded, and I’m lost. With captioning I’m on a level playing field with every other hearing person. I think I deserve to be included, because it wasn’t my choice to not be able to hear. Captioning simply makes sense, inclusion benefits all, and reading speech-to-text takes several separate groups, with various limitations and needs, and offers one solution to all. Universal and uniform captioning is like an all-purpose salve. Think of all of the reasons people around the world need to see speech … apply captioning generously.